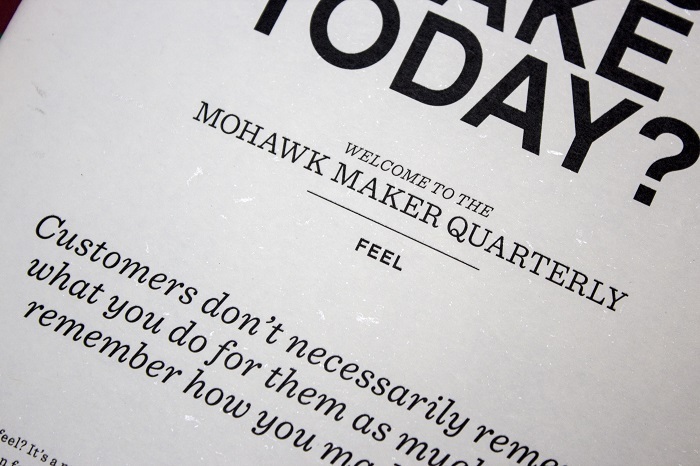 This week Mohawk unveils its eighth issue of the award-winning Mohawk Maker Quarterly, and you have to see it, read it and feel it to truly appreciate it. The issue tackles the topic of “feel,” exploring how experiences, environments, and objects invoke this nuanced word. “At Mohawk, we embrace the idea that the medium is just as important as the message in creating the ideal experience for an audience. It’s the cornerstone of our brand and the hallmark of building emotional connections. We agree with the claim that customers don’t necessarily remember what you do for them as much as they remember how you made them feel,” says Chris Harrold, Mohawk’s vice president of business development and creative director. 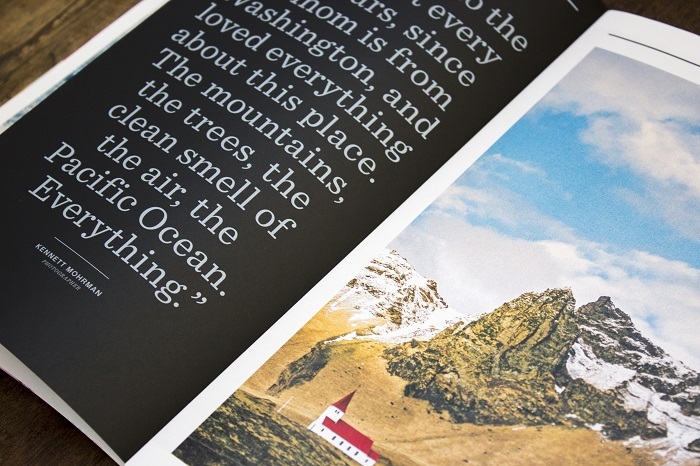 The cover of issue eight is printed on Strathmore Wove, Riveria Rose, one of four Strathmore Heritage Collection colors introduced in 2015, and inspired by The Strathmore Archive. The cover illustration by Olimpia Zagnoli is the fourth in a series of illustrated covers featuring bold, beautiful patterns. 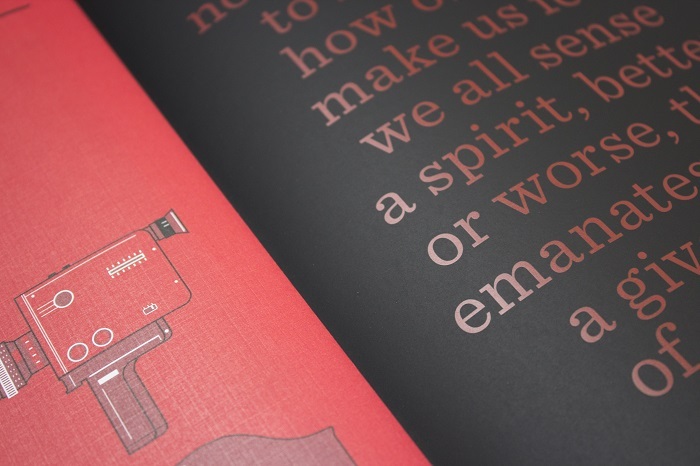 “With the Mohawk Maker Quarterly issue eight’s theme, “feel,” we wanted the cover to jump out and grab you, to compel you to pick it up, to feel it physically but also emotionally. Olimpia’s vibrant, unexpected color combinations and simple expressive characters were the perfect vehicle for that fun, emotional celebration,” says Caleb Kozlowski, design director at Hybrid. 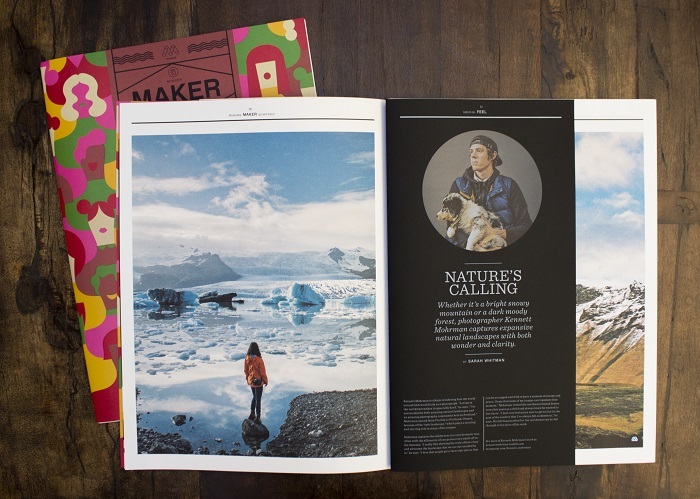 The publication’s finished size is 9.75 inches x 13.25 inches, and features full tabloid spreads printed on five different Strathmore papers, interspersed with short sheets (7. 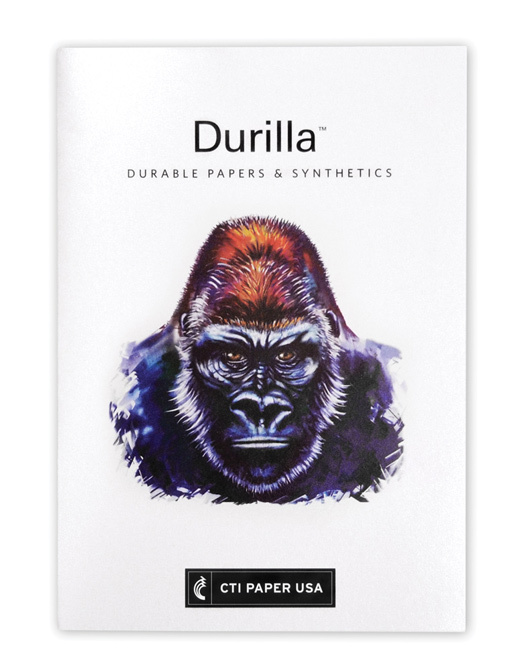 2 inches x 13.25 inches) printed on uniquely textured and richly colored papers from The Curious Collection. 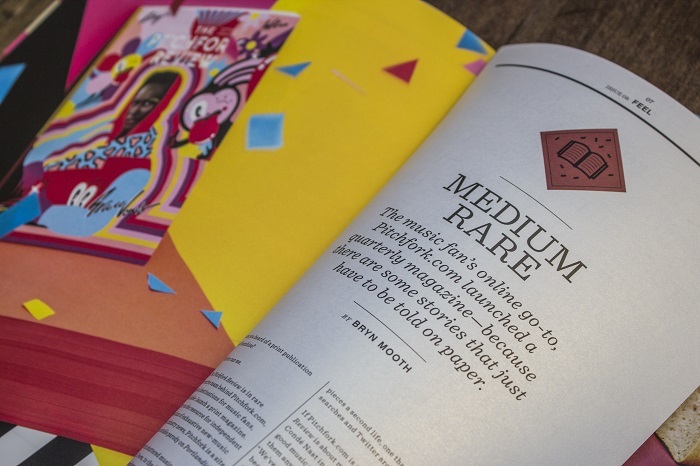 Medium Rare – The music fan’s online go-to, Pitchfork.com launched a quarterly magazine – because there are some stories that just have to be told on paper. This feature showcases the striking beauty of Curious Collection Metallics, Ice Gold, against vibrant images printed on Strathmore Wove and Smooth, Platinum White. Nature’s Calling – Whether it’s a bright, snowy mountain, or a dark, moody forest, photographer Kennett Mohrman captures expansive natural landscapes with both wonder and clarity. 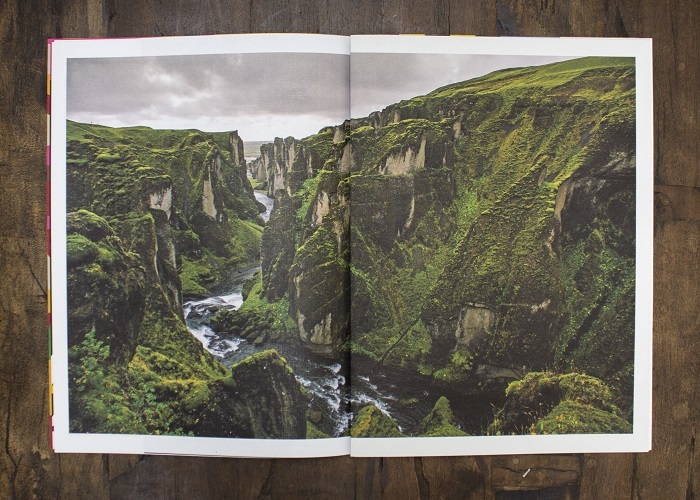 Featuring a two-page spread printed on Strathmore Cambric (p.14) and Strathmore Pastelle (p.15) showcasing very different finishes to highlight Mohrman’s stunning photography and a memorable short sheet page of Curious Collection Skin, Black, showing a full color portrait of the photographer. This piece is enhanced with bonus content available via Mohawk Live, using HP Aurasma augmented reality technology. 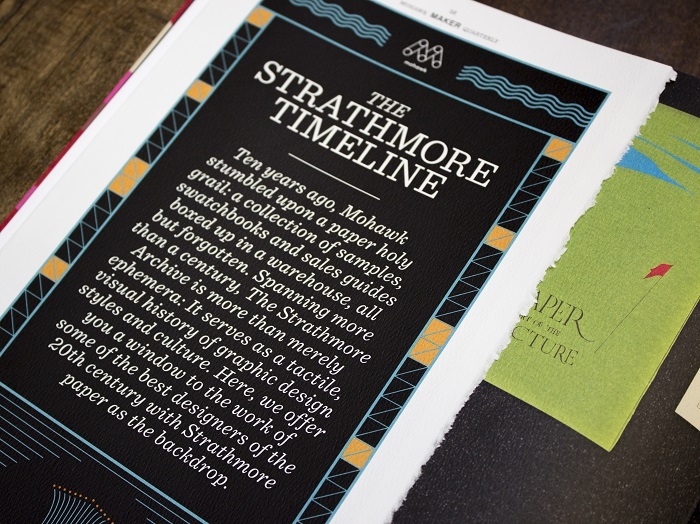 The Strathmore Timeline – Mohawk stumbled upon a paper holy grail when it discovered the Strathmore Archive, a collection of rare fine paper samples dating back to the late 1800s. 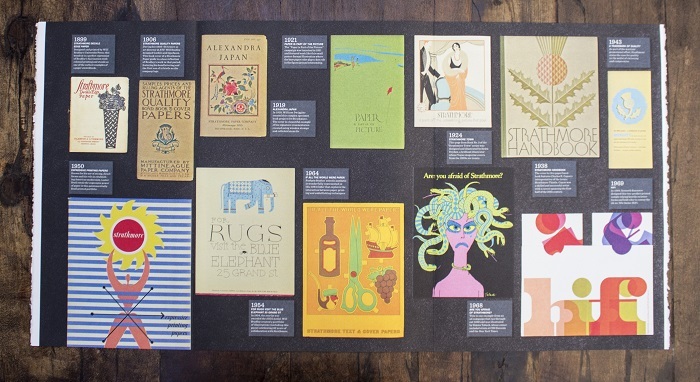 The center spread in issue eight is a peek at the 7,000+ objects in the Strathmore Archive. This pullout is beautifully illustrated on highly textured Strathmore Pastelle featuring a classic, time-honored deckled edge. 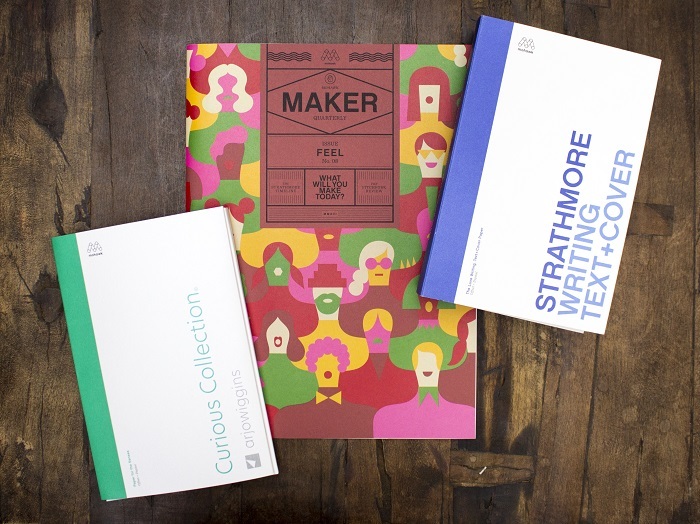 Harkening back to the roots of the Strathmore brand, Mohawk continues a legacy of fine papermaking that began in 1892, and remains today as one of the last manufacturers of fine, machine-made, deckled edge papers. 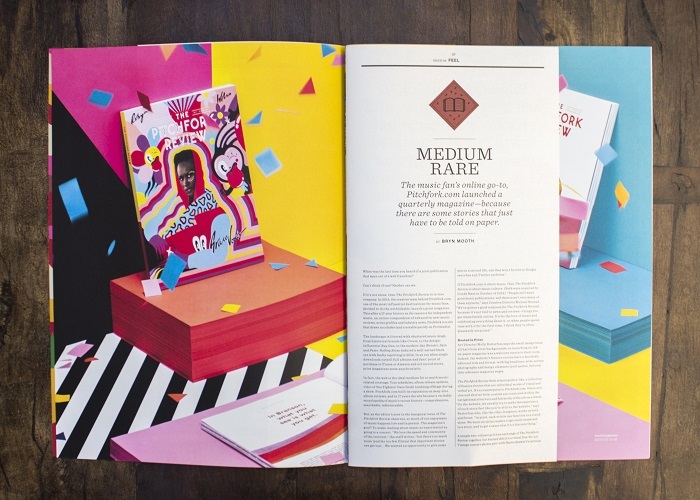 Brand Mirror – The best brands in the world aim to inspire instead of simply to sell. 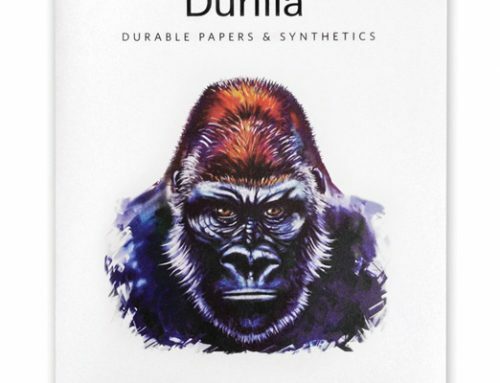 Written by Dora Drimalas. 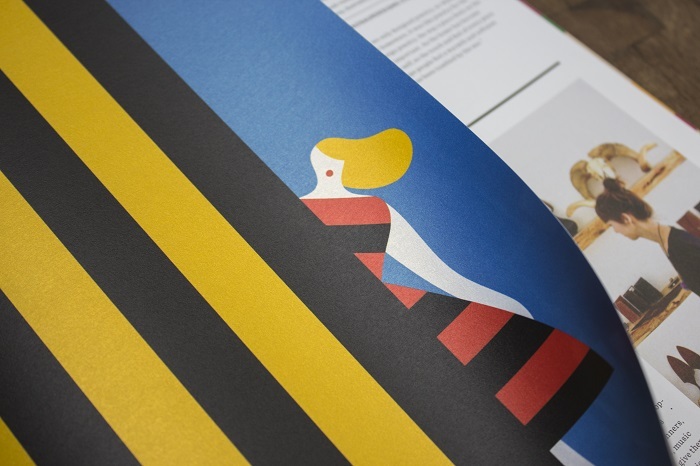 The Thing The Book – When artists create every facet of a book, from cover to index, it becomes a work of art. This article is enhanced with bonus content available via Mohawk Live, using HP Aurasma augmented reality technology. 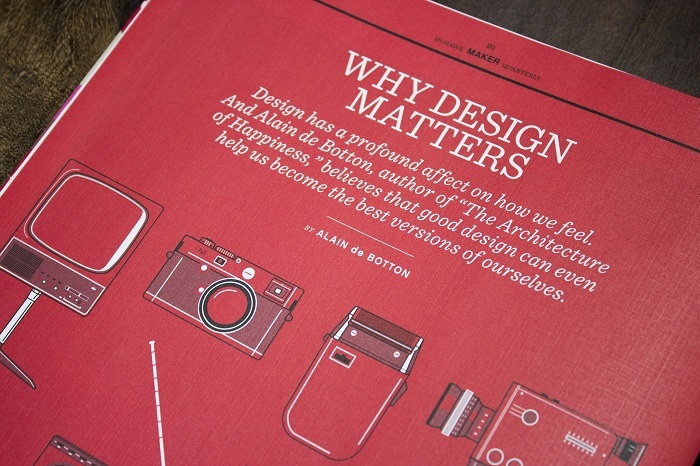 Why Design Matters – Alain de Botton, writer, philosopher and author of “The Architecture of Happiness,” believes that good design can help us become the best versions of ourselves. Illustrations by Mike Anderson printed on Curious Collection Skin, Black, adjacent to Strathmore Cambric Platinum White. 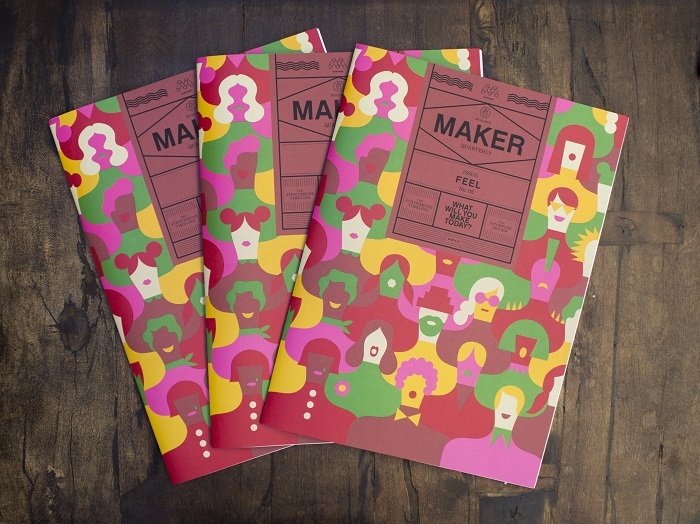 A variety of talented makers are profiled as Champions of Craft in issue eight, including Small Room Collective, Olimpia Zagnoli, Sebastian Cox, Object and Totem, Dinosaur Designs, Jacobsen Salt, Shelter Social Club, Penland School, Brothers & Craft, and Adam Silverman. Several features are enhanced with bonus content available via Mohawk Live, using HP Aurasma augmented reality technology. 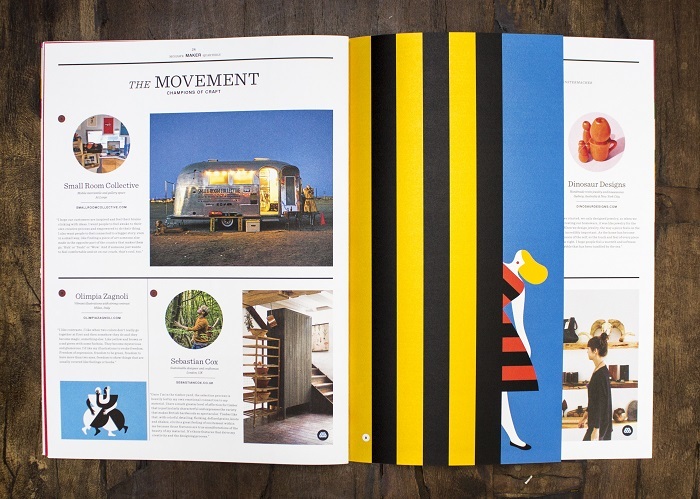 The Mohawk Maker Quarterly Issue No. 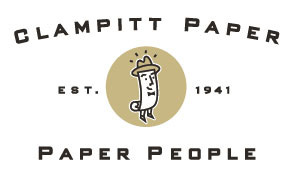 08 was skillfully printed by Sandy Alexander, Inc., Clifton, NJ, using conventional and UV inks. 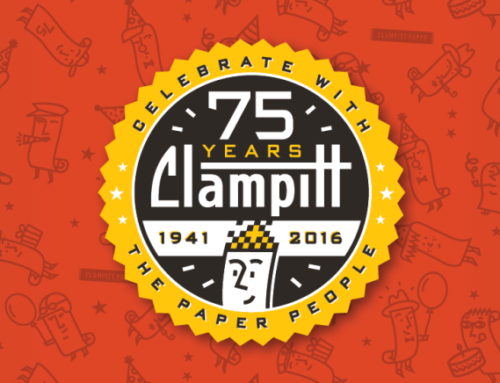 Clampitt Featured on Billion Dollar Buyer!